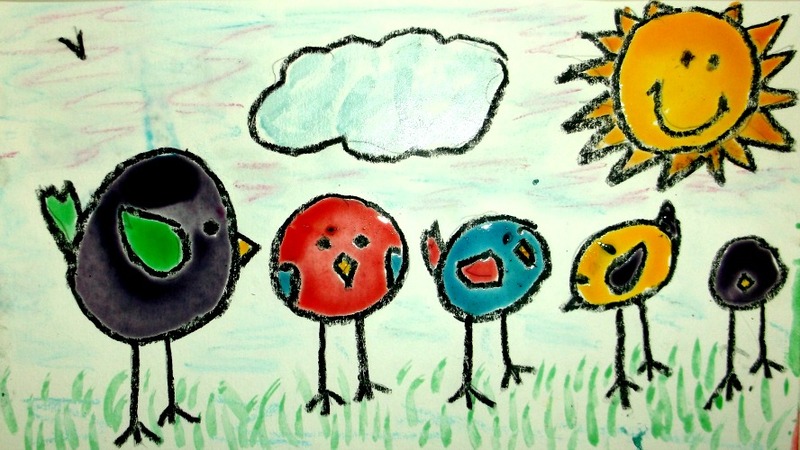 One of the favorite Bible stories for kids is the story of Noah and the ark. They can easily imagine Noah building a huge ark and then gathering together pairs of animals to save them from the big flood that God has promised. 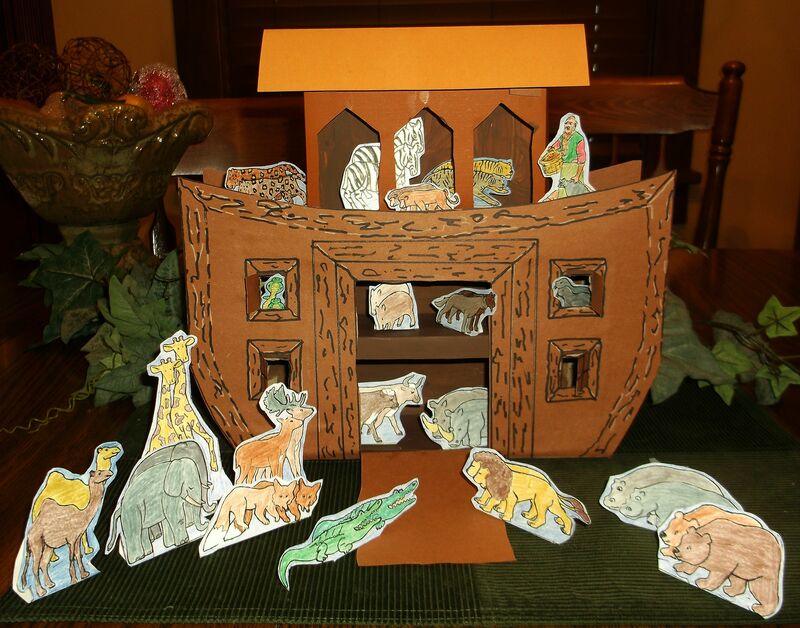 So, of course, the kids enjoy Noah’s ark art projects. You’ll find the tutorial for making Noah’s Ark in the Miscellaneous Gallery in the sidebar. Click on the photo for a close up view. 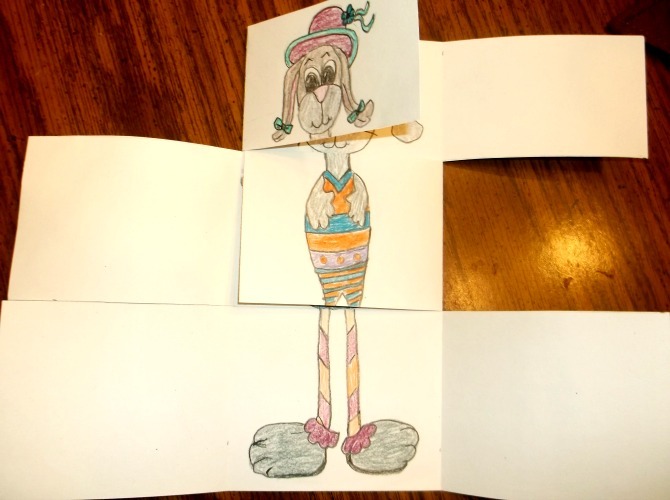 This funny bunny mix and match art project was so much fun to put together, so I know the kids will really enjoy it. It only takes one sheet of construction paper and a little imagination, plus colored pencils, to make a fun and funny tri-fold splitter. 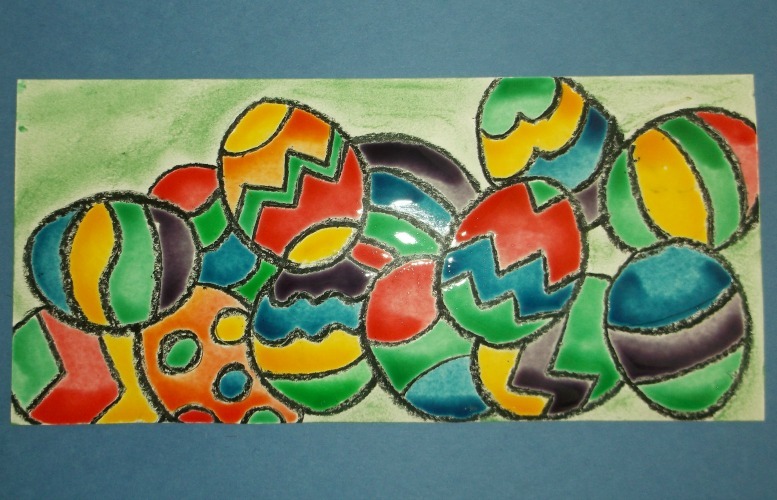 You’ll find this project, “Funny Bunnies Tri-fold Splitter,” in the Easter Projects Gallery in the sidebar. Click on the image above for a close-up view. One of the men crucified with Jesus admits that he deserved to be hung for his crimes, and said that Jesus had done nothing criminal and didn’t deserve to be crucified. We read in the gospel of Luke 24:42 Then he said, “Jesus, remember me when you come into your Kingdom.” Click the image for a close up view. 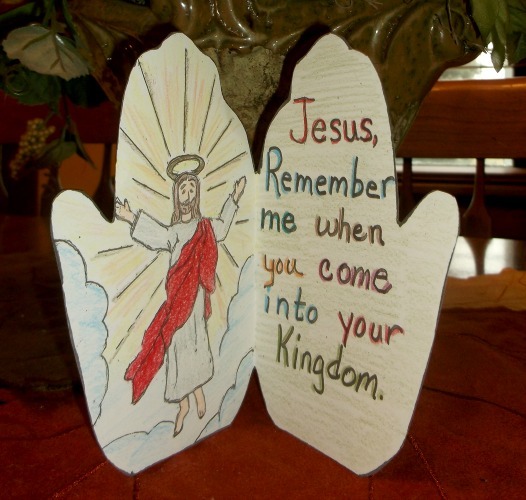 You’ll find this project, “Jesus, Remember Me” in the Easter Projects Gallery in the sidebar. Children like to know how their name was chosen. If they were named after a Saint, they are especially interested in learning about the life of that Saint. When a person shares the same name as a saint, the saint is thought of as their patron saint. There are some saints that we call on for specific needs. For instance, we ask St. Christopher to pray for our safety when traveling and St. Anthony when we look for a lost object. St. Christopher is the patron saint of travelers and St Anthony the patron saint of lost items. Just as we ask our family and friends to pray for us, we can also ask a saint to petition for us by praying to God on our behalf. 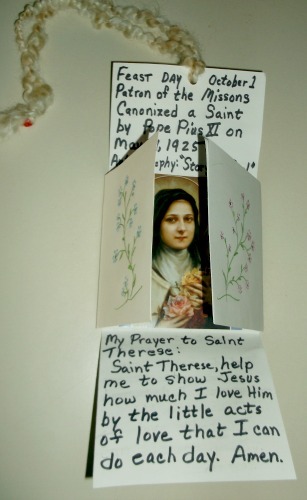 Find the project for making My Patron Saint Wallet in the 3rd Grade Projects Gallery in the sidebar. Spontaneous prayer isn’t easy for everyone, but it becomes easier with practice. This prayer circle is meant to help express love and appreciation to our Heavenly Father, for all the gifts we receive daily. It reminds us to express our love for Him and to thank Him for the family and friends that He has blessed us with. Pray by asking for God’s help, to make right choices in all that we do and to always do His will. Thanking God for good things that happen, as they happen, make for good prayer habits. A quick, spontaneous prayer asking for help dealing with school subjects or disagreements among friends strengthens our relationship with Jesus. 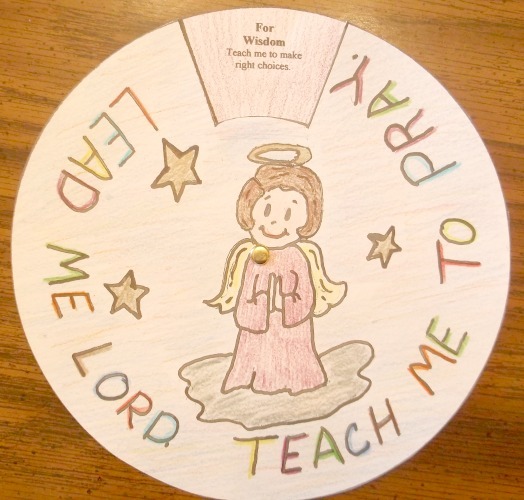 Although this prayer circle is appropriate for any grade, you’ll find the directions for this, Teach Me To Pray, project in the 3rd Grade Projects Gallery in the sidebar. 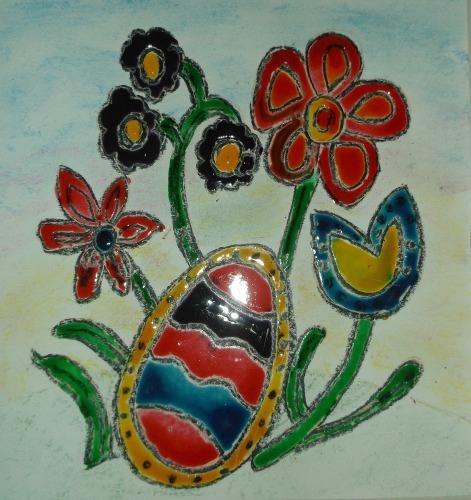 How would you like to make a beautiful, super bright and shiny, enamel looking when dry, stained glass, piece of art? 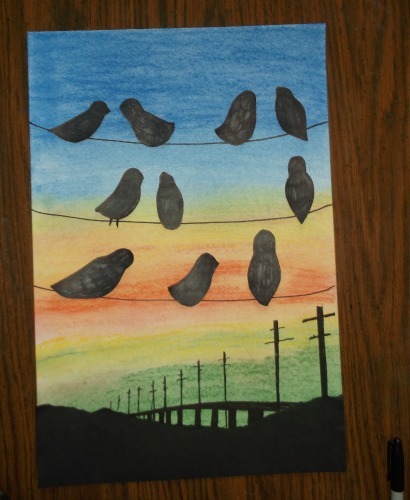 This has to be one of my all time favorite art projects. I love the bright colors and am always amazed at how easy, and inexpensive, the paints are to make and use. The paints are made by mixing corn syrup, vinegar and food dye. The vinegar cuts the sticky-syrupy consistency, but doesn’t change the enamel look when dry. 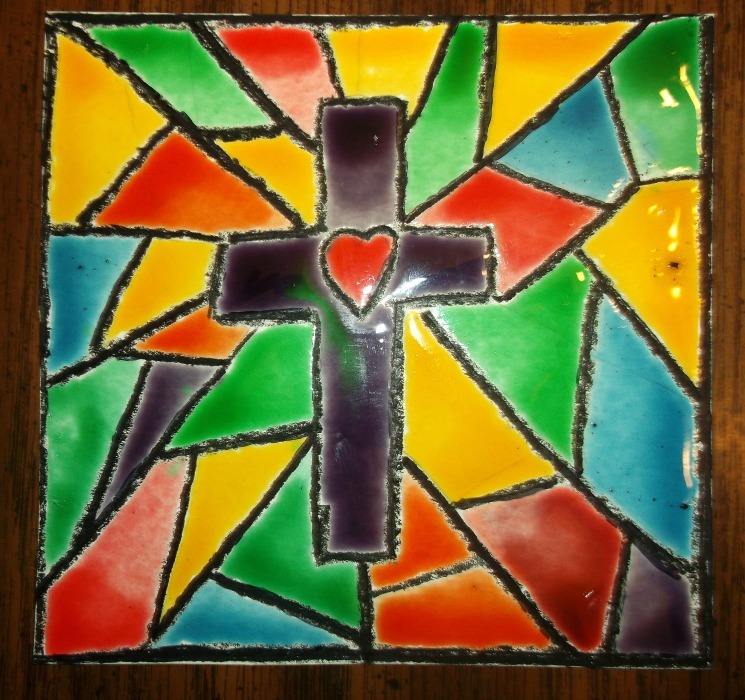 This project, “Faux Stained Glass Art,” is found in the HubPages Projects Gallery in the sidebar. For a close-up of the images above, click the photos. 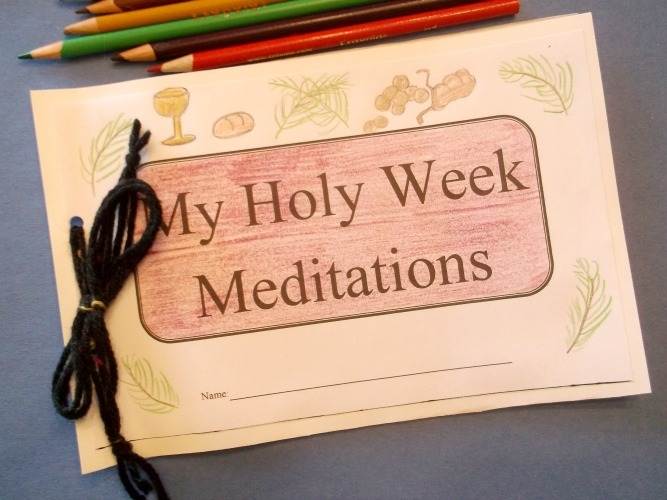 I think this would be a nice Holy Week project, getting ready for Easter Sunday. Although this diorama is made only with paper, it could be changed, depending on how much time you have, by making the tomb and stones of clay. Also, a few copies of the hills could be made, to make a middle group and a front group of hills. Maybe keep the hills separated by using self adhesive foam strips between them. 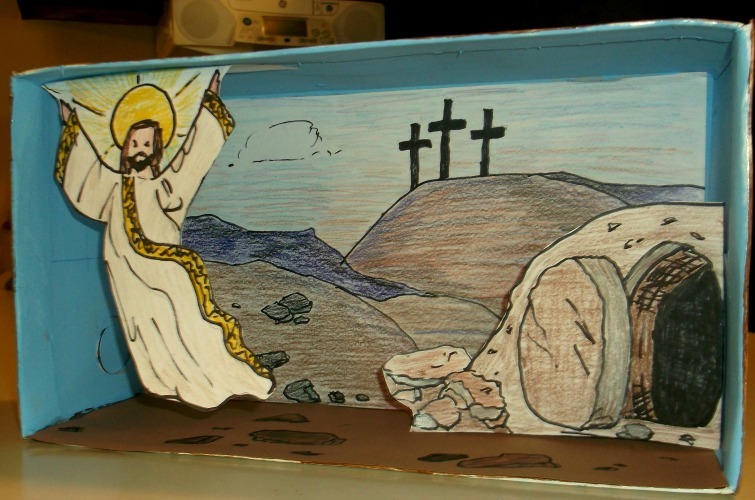 The tutorial for making this project, “Resurrection Diorama,” is found in the Easter Projects Gallery in the sidebar. Click on the above image for a close up view. Click here to visit Masketeers.